The school offers a rich mix of the traditional and the modern – the cultural heritage of the former, and the technological, pedagogical and creative advances of the latter. The institution has a learning environment that is invigorating and unfolds the true potential of every child. The students, thus excel not only in academics, sports and co-curricular activities but also evolve as responsible and caring individuals. Moreover we instill in the girls the right values and attitude to lead a fulfilling and balanced life. The school also gives utmost importance to developing a strong foundation through discipline, character building and traditional values. We believe that every child is unique, and that by providing individual attention the immense potential within her can be tapped. Therefore we have created an environment that’s ideal for joyous learning where teachers act as facilitators, and aim to raise children who are conscious of their responsibilities. To impart an integral education, that is global and all-comprehensive, based on a strong foundation of Indian tradition, culture and values. Integral education means complete and total education, taking into account the physical, intellectual, emotional, and spiritual development of the child. Global connotes an ‘Institution with a Global perspective’ that uses the latest pedagogical techniques and achieves learning outcomes that cater to children coming from different parts of the world, who eventually bond and learn to live together in harmony. All-comprehensive means the education is holistic that imparts global knowledge as well as instills in the students the virtues, right attitude and approach to lead a fulfilling and balanced life. The school stands out for not only giving wings but also keeping the children grounded by inculcating morals, ethics, values, and respect for our rich culture. At DMPSSS, we believe education should empower children to live a balanced happy life. We endeavour to build strong character that helps students understand and appreciate the right values. 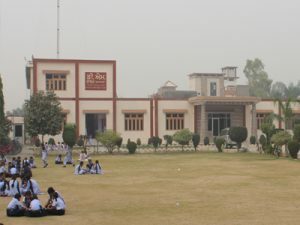 To mould the character of our students, and groom them into balanced individuals, we work towards imparting what the World Health Organization describes as the nine major life skills: decision making, problem solving, critical thinking, effective communication, interpersonal relationships, self awareness, empathy, self-esteem and coping with stress.